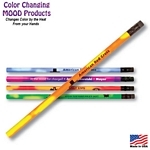 Promotional Mood Pencil Color Changing Pencil, Item #20550 has a large imprint area for printing your company logo and slogan. Our Customized Pencils are long lasting and perfect for any activity that requires writing in pencil. Promotional Mood Sham Click, Item #15235 comes with a push top retractable plastic design for an affordable company promotion. Our Customized Plastic Retractable Pens include an artwork imprint to advertise your company and services. 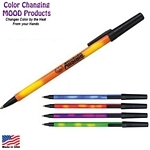 Promotional Mood Stick Pen, Item #13550 from PenImprint.com is one of our most affordable promotional pens. 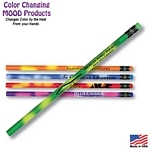 Our Customized Stick Pens include an artwork imprint for advertising your business logo and slogan. 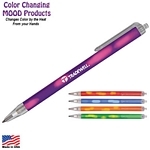 Promotional Mood Pencil with Colored Eraser, Item #20551 comes with a push top retractable plastic design for an affordable company promotion. Our Customized Plastic Retractable Pens include an artwork imprint to advertise your company and services.